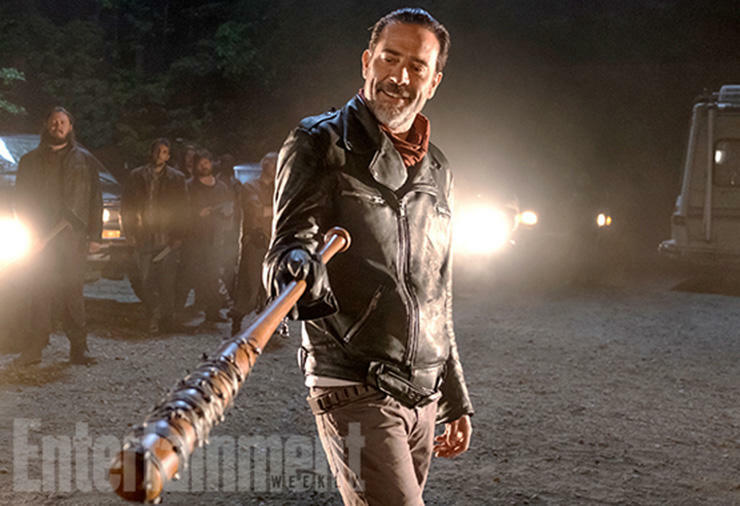 AMC has published the first image from the season premiere episode of The Walking Dead, but if you told me it was a screenshot from last spring’s finale, I would have believed you. This is Negan, performing the rant we’ve already heard. He clearly hasn’t done the deed yet because Lucille is nice and clean. Come on, AMC, this doesn’t count. I realize you can’t exactly show us the answer to the mystery or anything, but we could at least get a screenshot of Carol or Morgan since they are elsewhere. Heck, I’d even take a photo of Enid sitting in a closet. Fortunately, there’s still hope. The Walking Dead Comic-Con panel happens to be next week. Not only will we get some fresh information out of it, we should also be getting a new trailer if reports are correct. The panel takes place July 22. As the banner says, The Walking Dead returns this October on AMC.